Source: Charles Darwin Foundation Press Release. 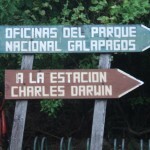 Dr. Francisca Massardo, coordinator of the Universidad de Magallanes in Puerto Williams, was recently invited to participate in an international workshop on “Island Cultures and Sustainable Lifestyles,” hosted from 28-30 September at the Charles Darwin Biological Station, Galapagos Islands, Ecuador. The event brought together international experts from islands of the South Pacific, New Zealand, Easter Island, Fiji, the Orkneys and Galápagos, and Chile, who together with members of local and national institutions, NGOs, and invited guests, exchanged experiences on the themes of island societies and environments. This is CDF’s second international “Island Sustainability” workshop among a series programmed for 2010-2011 covering topics such as tourism, energy and transport, water and waste management, and climate change, among others, all linked to island conservation and sustainable development. Between 5 and 20 September, representatives from the Universidad de Magallanes carried out an series of trips to the University of Alaska – Fairbanks (USA) and Tromso University (Norway). The delegation was headed by Dr. Andrés Mansilla, Director of Research and Graduate Programs at UMAG together with Dr. Christopher Anderson, Coordinator of the Sub-Antarctic Biocultural Conservation Program and Dr. Silvia Murcia, academic of the Master’s of Science in Management and Conservation of Sub-Antarctic Ecosystems. The academic tour was the result of recommendations from the Chilean National Accreditation Commission, which suggested to UMAG to strengthen its links with other universities in similarly high latitudes, which provides meaningful comparisons and exchanges for research and collaborative projects. With funding from the Ministry of Education, the Office of Research and Graduate Programs and the Sub-Antarctic Biocultural Conservation Program, these delegates visited Fairbanks, Alaska; Denton, Texas; and Tromso, Norway to meet with authorities and professors in areas such as Environmental Science, Engineering, Mining, Tourism, Renewable Energy, Conservation, Health, Oceanography & Fisheries and Agriculture, as these topics relate to high latitudes. Photo: Drs. 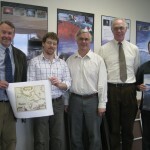 Anderson and Mansilla meet with directors of the International Arctic Research Institute, the Polar Biology Institute and the Office of Research at the University of Alaska – Fairbanks.